We’re big fans of risotto in our house. It used to be one of those things that we thought was really hard, or time consuming, but it’s actually not. Especially now – Mark tried out the BLW cookbook oven-cooked one with aubergine & courgette a while ago, as opposed to the stand and stir variety and we actually found it nicer – less stodgy and clumpy. It’s definitely less effort too. After a lovely long zoo trip the other day, when Dom was almost running on empty – tired out from animals, slides & other kids – we thought a variation on the oven cooked risotto starring what ever was in the fridge/garden would go down a treat. Mark set to getting onions, garlic & peppers on the pan, while I went into the garden. Yes, dear reader, I harvested a few little carrots, and some sage and parsley. The pride! I was bursting with it. Now, I don’t think Tesco will come a-calling with orders any day soon, but I don’t care, my double-pronged carroty wonders were awesome. Except the one with the approx 18 inch long root, for what lay beneath was a miserable greeny tinged number. There’s a lesson there somewhere. Hurry up and take photo so I can eat. The carrots softened nicely in the 20 mins in the oven, as all the stock goes in at once so they get a chance to cook through. This means I don’t have to go picking out crunchy carrot bits from Dom’s dinner. 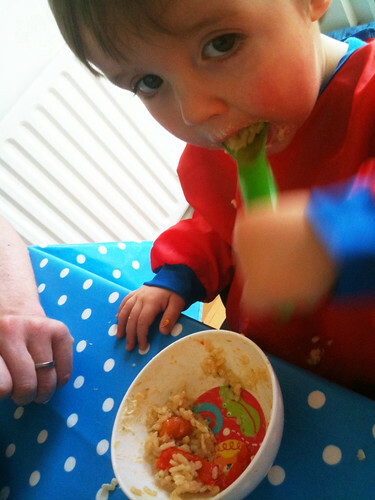 Risotto is a brilliant BLW food. You can use low salt stock, get a variety of vegetables and cheesiness into junior. It sticks nicely to spoons and forks and little hands. Our friend Tina over at Cookwithtina.com was enquiring about freezing risotto on The Twitter the other day, but I honestly can’t say I’ve ever tried – ours is always gone with one sitting & one batch of leftovers. You could…make double and use the leftovers to create arancini (fried risotto balls) – just roll cold spoons of risotto in panko breadcrumbs & fry. Very delish!